Big Texas style meets comfort and convenience at The Corners Apartments. 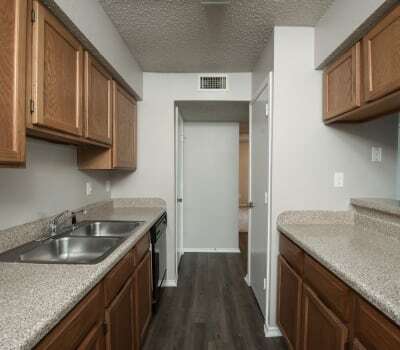 Each of our one and two bedroom apartments for rent in DeSoto, TX, offers a spacious floor plan complete with the features you need to enjoy your modern life. Housed in beautiful buildings surrounded by mature trees and professional landscaping, your new apartment is your invitation to live well and rest easy. Choose your new living space from our variety of floor plans finished with a fully equipped kitchen, impressive features, and a private outdoor space to call your own. Indulge in affordable luxury at The Corners Apartments. Nestled in the charming city of DeSoto, TX, and situated just five minutes from I-20 and I-35, the living spaces at The Corners Apartments are crafted to compliment your unique modern lifestyle. In addition to the spacious and contemporary layout, your new apartment boasts an array of first-rate features. After you prepare a delicious meal in your fully equipped kitchen, load your time-saving dishwasher for an easy cleanup. Once you’ve put everything away, put up your feet and relax in the glow of your striking in-home fireplace or take advantage of the warm Texas weather on your private balcony or patio. Let us show you around our unique and spacious homes at The Corners Apartments. Give us a call today to schedule your personalized tour of our one and two bedroom DeSoto, TX, apartments for rent near Dallas.